The saturation in the traditionally preferred location in Mumbai and MMR for investment in residential realty is resulting in demand of newer peripheral locations which is seeing influx of increased connectivity which has resulted into developments of newer residential hotspots. These new sub-markets are finding traction from investor class eyeing price advantage compared to an established CBD viz BKC, indirectly seeing influx of residential developments offering a good ROI be it office space or residential purchase. The developments seen in these newer sub-markets offer best of world class amenities, improved connectivity and large open spaces. Few of the markets which are currently witnessing such trends along with good ROI include locations like Sion, Kanjurmarg, Andheri, Mira Road and Panvel. What makes these locations attractive is the upcoming infrastructure like Metro Connectivity, Rail and Road Connectivity; Proximity to Business Districts, Lifestyle Amenities and Price Appreciation. Sion, a perfect city junction that connects an island city from the east to west, has remained the most-wishful location for residential buyers. An upward price movement of residential realty in Sion is the result of its geographical advantage. Be it gated communities of cosmopolitans, higher income groups or non-residents all find solace in investing into various residential realty projects located in Sion. The trend has shown that the residential realty investment in Sion has always offered better returns due to its location supremacy. Sion has always shown a rising pricing trend. Thanks to the connectivity factor it boasts. It provides the ‘Living on the Highway’ advantage to homebuyers as it falls on the Eastern Express Highway that opens up Mumbai to the corridors of Pune and Goa. Sion has always been the preferred location for corporate homebuyers, who want to enjoy a ‘walk-to-work’ culture with easy access to business districts of Bandra–Kurla Complex and South Mumbai. Sion has shown a good resilience in the re-sale property market depending upon the factors like construction quality, amenities available in the project, etc. The region also has tremendous potential to unlock space through redevelopment, many of which can be formalized soon once the SRA reforms are completely in place. “The next phase of development of the area is likely to be in terms of redevelopment of older societies and slums; which will take place gradually over the coming years and also due to the existing and upcoming infrastructure projects. Further, considering the price trends, this place will prove to be a game changer in the Mumbai’s real estate market”, added Sheth. JLL India in their proprietary research report ‘Livability Quotient – A Paradigm Shift in India’s Emerging Cities’ had identified Navi Mumbai as one of the best satellite towns offering relief to the growing densification problems of Mumbai. Surrounded by mountains and lush greens all around, Panvel city enjoys the maximum livability quotient as it is a planned development by ‘The City and Industrial Development Corporation of Maharashtra’ (CIDCO). The proposed Navi Mumbai International Airpot is a major influencer for the city development. Besides this, the Mumbai Trans-Harbour Link, Virar Alibaug Multi-Modal Corridor, Panvel-Vashi Metro line, Panvel-Karjat Railway line promises best of the best connectivity through all modes of transport. The proposed NAINA city (Navi Mumbai Airport Influence Notified Area) by CIDCO, which is in the works, will further see prices soaring once it begin getting action. Located close to Mumbai-Pune expressway and the Sion-Panvel, it also provides easy access to both Mumbai and Pune. Panvel in Navi Mumbai is fast moving up on the list of the desired destination for homebuyers due to a mix of ‘pull factors’ going its way. As the previously preferred locations like South Bombay reaching a saturation point due to skyrocketing prices, Panvel has emerged as an affordable option for both Mumbai and National buyers. Andheri possesses many gated communities, luxury apartments and commercial spaces. The location offers excellent connectivity and social infrastructure and these are the major reasons for its rapid growth. Thus, there is no denying that Andheri is certainly one of the best places to live in Mumbai. When you talk about the Andheri realty market, it is always classified into two parts – Andheri East and Andheri West. While Andheri East has metamorphosed into a major commercial destination and is the densest micro-market in Mumbai, comparatively Andheri West is one of the posh and the oldest residential areas of the city. Andheri East is logistically connected to the Mumbai International Airport and Western Express Highway facilitating access to other commercial hubs like Bandra Kurla Complex, Lower Parel and eastern suburbs like Ghatkopar, Vikhroli, Powai, Kanjurmarg, etc. Also, well known as a prime industrial destination due to the presence of MIDC and SEEPZ, it has been accommodating office spaces, IT and consulting companies. Andheri West on the other hand already houses some of the biggest entertainment companies in the country like Balaji Telefilms, Yashraj Studios, Sahara TV, Big FM, etc. The suburb is connected well with major landmarks of Mumbai. As a result, there has always been a high demand for residential apartments in Andheri West, being one of the noted areas in Mumbai. It is interesting to note that the suburbs from Andheri to Malad account for nearly one-third of the entire high-end launches witnessed in Mumbai last year. Amenities in these projects mirror the high-end luxury segment, ranging from concierge services to preview theatres, ballrooms, home automation systems and sculpture gardens. The growth in the number of projects here is a response to the rise in demand. The Metro line running through the heart of the Andheri between Versova and Ghatkopar has played a significant role in recent years, leading to an increase in demand for space at nearby locations. Andheri is currently on a realty growth track. Taking into consideration the planned infrastructure initiatives like the enhanced metro connectivity and the increasing demand for office properties, one can expect considerable growth in the area’s real estate market in the near future. Kanjurmarg – A location in the Mumbai suburbs which holds the three aces of accessibility, affordability and appreciation potential consolidated with good social infrastructure and workplace hub integration, it can rightly lay claim the most coveted property investment hotspot tag. Today, it is a vibrant, pulsating suburb that boasts of well-developed infrastructure, remarkable connectivity and residential projects that add a new dimension to luxury living. The development of the Eastern Express Highway, along with JVLR and the Eastern Freeway, has significantly improved the connectivity to other parts of the city and aided the rapid transformation of the Central suburbs. Newly-developed locations along the Central suburbs such as Kanjurmarg have an edge over other locations due to the presence of high-end residential complexes loaded with state-of-art modern amenities and facilities. Kanjurmarg has excellent connectivity with the business districts of Thane, Powai and BKC as well as South Mumbai via LBS road, JVLR, Eastern Express highway, SCLR and the Eastern freeway. Its strategic positioning on the central line provides easy accessibility to both the Harbour and Western lines of the city's local rail network. “With excellent connectivity, access to upmarket lifestyle spots, quality housing such as what we are developing and extremely attractive real estate prices, Kanjurmarg is the poised for an exponential rise similar to Powai. It is an extremely attractive option for luxury home buyers”, says Subodh Runwal, Director of Runwal Group. 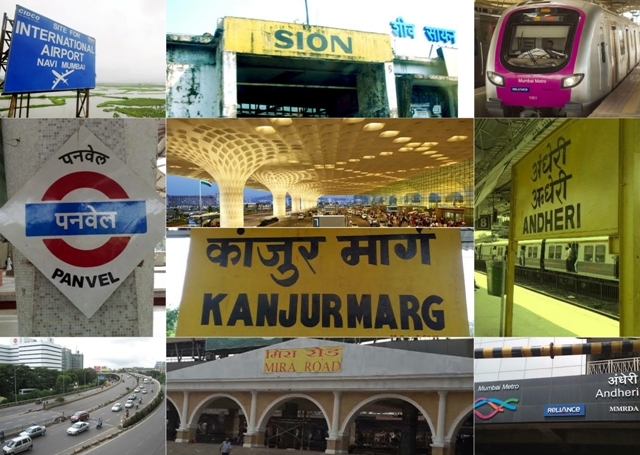 Considering the overall real estate trends in Mumbai and factoring in affordability, infrastructure and connectivity, Kanjurmarg offers good returns on investment. Large residential towers, office complexes, 5-star hotels and shopping destinations now dominate Kanjurmarg's skyline. With its already excellent connectivity set for further enhancements with the completion of the metro rail lines connecting it to Andheri and Thane, Kanjurmarg can comfortably put many other contending real estate locations in the shade – now and in the future. An enviable location, impeccable connectivity, developing infrastructure, well planned projects at affordable values and green environs – it’s no wonder that Kanjurmarg is becoming the preferred residential destination of upwardly mobile individuals and families. One of the promising belt which is coming up in Mumbai Metropolitan Region is Mira Road. As the entire North corridor of Mumbai is proving to be a promising belt for Mumbai’s realtor's fraternity, their attention on Mira Road is equally increasing due to the upcoming infrastructural developments like metro, coastal roads, and other social infrastructure. In past two quarters, Mira Road alone has witnessed umpteen number of new residential project launches and the micro market has observed a continuous and ever-growing price appreciation from 2007 to date. Various parameters responsible for the same are great connectivity to central and southern Mumbai, Social and physical infrastructure, Open space, Price quotient and the residential development in and around the micro market. With a variety of commuting options, people are taking a keen interest in properties available in the area. Located on the western line of the Mumbai suburban railway, it has easy connectivity to Navi Mumbai, Thane, and Mumbai. The state government has also announced a number of projects to develop infrastructure across the MMR. These project s include a Metro corridor from D. N. Nagar to Dahisar (Metro 2A) and Andheri to Dahisar via WEH (Metro 7). The Coastal Road Project too will extend from Nariman Point to Kandivali and the Navi Mumbai Airport driving up the property prices in these areas. With close proximity to the Western Express Highway, the Mira-Bhayandar Municipal Transport (MBMT) also makes traveling convenient with its bus transport services.As more corporates move towards the suburbs, Mira Road is quickly becoming a sought-after place for white collared employees to shift base too. Besides zooming to work on the Western Express Highway, the upcoming metro projects are sure to offer a quick alternative to ferry from work and back home. Ajay Nair, COO, JP Infra Mumbai says, “With new future developments such as Mumbai coastal road, Mumbai trans-harbour link, Mulund Goregaon Link Road, new Mumbai metro corridor - Cuffe Parade to SEEPZ and Dahisar to DN Nagar which is likely to be extended till Mira Road, Dahisar east to Andheri east will result in faster commuting to all these areas resulting in increased residential and high quality social infrastructure developments in all the new micro-markets in the North of Mumbai. All these factors have resulted in an increase in demand for residential space in the North”.